`What’s In This Policy Issue? 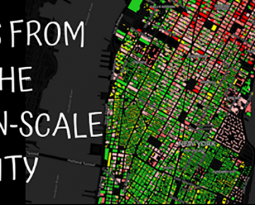 Human-scale NYC is a city-wide non-profit devoted to human-scale urbanism and democratic control over the built environment. We operate as an information-sharing network by, for, and of volunteer civic leaders and community-based activists from all five Boroughs. We welcome new groups and organizations to that network. We think many of our built environment problems can be solved through a human-scale, incremental build-out of our city that does not destroy what we love about our city. We are data-based and like to do our homework, be it studying the zoning code, researching spreadsheets on who gives what to who at the Campaign Finance Board, or reading laws that need editing. We do not have salaried staff and operate a literal shoestring. We don’t endorse candidates for office but do give opinions about their track records on human-scale urbanism and their financial or employment relationships to the real estate industry. 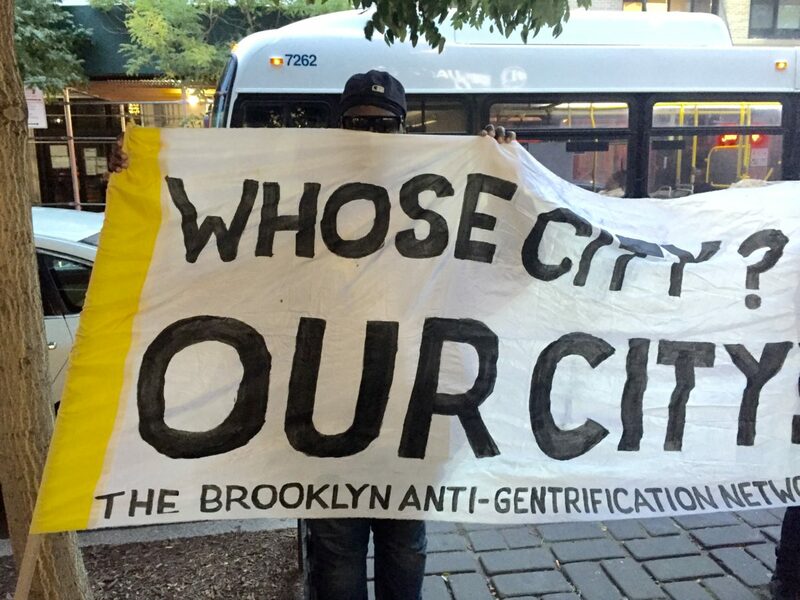 Right now we think the biggest threat to our city’s democracy is the excessive power of the city’s real estate lobby, a disturbingly oligarchal industry whose power has infected nearly every corner of civic life. 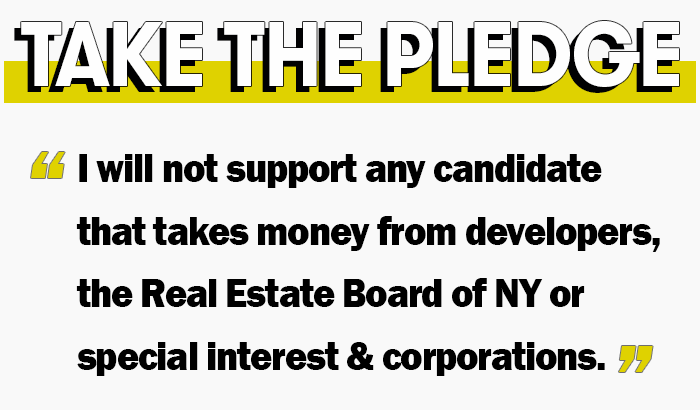 Click here to take our Voter Pledge not to support candidates who take real estate money. Click here to make a tax-deductible contribution to our shoestring budget. And here is our newsletter. This is the long policy issue, so kick back with some coffee and dig in. Send corrections, typo alerts, and offers to volunteer here. Be persistent if you want to volunteer, as often we are just overworked. The headlines over Amazon’s retreat from its second headquarters deal in Long Island City reveal much about the state of the world today. There is the fascinating trainwreck of a corporate titan acting like a petulant child. There is the Wall Street Journal editorial board having a full-blown panic attack over fantasy job numbers and the “business environment.” And there are the excessive and vicious attacks on those who had the temerity to disagree with Cuomo and De Blasio, culminating in the shocking verbal abuse that came out of the mouth of developer David Lichtenstein, a board member of the city’s Economic Development Corporation. We – and other community groups – call for his resignation from that board. I don’t want to dignify his words by repeating them, but you can read about it here at The Real Deal. To be optimistic about all this, the conservative backlash from Cuomo and the WSJ and Lichtenstein might just be the “death rattle of a dying paradigm” about corporate welfare. In any case, New Yorkers have been writing up a storm about it all! Here is a round-up of the best thinking. 1. For the best argument for why we dodged a bullet when Amazon walked away, see urbanist Roberta Gratz’s brilliant essay at Common Edge here. 3. Ross Barkin’s essay in the Gothamist about the shift in political winds and its effect on Governor Andrew Cuomo is pretty good (although he massively inflates the Amazon job figures). It can be found here. 4. If you are in need of an empirical reminder about why corporate welfare is a pointless waste of taxpayer money, see this nice summary article in The New Republic here. Do we really want Amazon delivering to our tower windows via drones? The ideal Amazon customer is from the Pixar film “Wall-E”. Amazon’s plan to get us addicted to Prime has terrible side effects! It is turning us into consumers right out of the Pixar kids movie about the future, Wall-E. In that film, humans had trashed earth and were surviving in space where they grew spineless from lack of exercise, sitting in comfy chairs binge-streaming TV 16 hours a day, eating food delivered to them by robots. The Wall-E humans had forgotten how to walk. In Amazon’s version of that story, we will stay in our apartments, everything we consume or watch will come from an Amazon supply chain, our medicine from an Amazon pharmacy, our money from an Amazon bank, our news from an Amazon newspaper, and our entertainment from an Amazon movie studio. Do we really want One Big Business to Rule Them All? Amazon’s labor practices are sickening. Just google it. They are anti-union. They help ICE kick out immigrants. Then there are the many reports of how badly Amazon treats its warehouse workers. Amazon is the most anti-urban bully among the giant corporations running our lives. 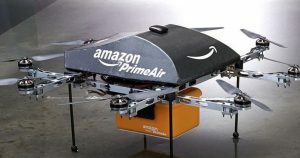 Amazon’s anti-urban crimes are many and include: their expansive plan to use robots (45,00 of them as of a year ago); cashier-less stores (called Amazon Go stores); their intentional, willful destruction of small storefront Mom and Pops; their soulless storage lockers that create moonscapes in cities; and the number of delivery vehicles that clog our streets (and no, Amazon drones are not the solution to that, see the Wall-E problem above). But here is the anti-urban kicker: Amazon forced the City of Seattle to lift their height cap on buildings so Amazon could build its hideous over-scaled first headquarters as a tower in that city. Need I say more? The whole “25,000 high paying jobs” was political theatre and a rhetorical device for grand-standing pols. Nobody knows how many jobs Amazon would actually create (including Amazon) and it was up to Amazon to self-report the jobs it brought in. Amazingly, our pols did not structure a deal that included independent auditing of Amazon’s compliance in providing jobs. Moreover, nobody thought to factor in the jobs that would be lost by Amazon’s world-renowned effectiveness at using monopolistic practices to wipe out small businesses. See Reason Five. Prime supports Amazon’s plan to wipe out storefront Mom and Pops, not just Amazon’s big corporate competitors. While I shed not a tear for Amazon’s big-box rivals, our economy and shriveled democracy need Main Street and small businesses far more than we need Amazon-style corporate overlords. Small business is what makes urban street life great, without it, we’d just have chain stores and that dystopia called Hudson Yards (ugh…). What kind of city do we want, anyway? Our prime addiction fuels Amazon’s monopolistic practices as well. Amazon’s business model relies on monopolistic bait and switch and other unfair business practices to seize a supply chain and then take out everyone, from little corner grocery stores to Walmart. It is about time to wake up from that Reagan-era induced dream state where we pretend the behavior of monopolies is okay. As an example, think about how you got drawn into Amazon’s ecosystem through the love of same-day delivery, then read this about the new weekly delivery system for prime customers. The tax giveaways and incentives Cuomo offered Amazon were (and are) rip-offs that are also plain unnecessary. They were political theatre for Cuomo and De Blasio to brag about jobs nobody would have been able to verify the existence of. And hey, there is also a “consensus in the literature” among academics that most of the companies who got tax incentives to relocate would have moved to the location anyway without the tax incentives. States and cities would be better off curtailing tax incentive programs. Amazon paid zero in federal taxes in 2017 and even got a $197 million in rebates from us taxpayers, all while fighting down a tax in Seattle to fund homeless services. Worse, it owes its growth and wealth not just to its magical shopping cart, but also to billions in tax breaks from all over the country. Why aren’t politicians doing something about that? Is that how we went our corporate overlords behaving? Amazon scammed the entire political class (and thus us) in its nonsensical search for the best deal for a new headquarters. Despite the claim of “withdrawal”, Amazon is coming to NYC anyway, with or without a Long Island City campus, with or without incentives. 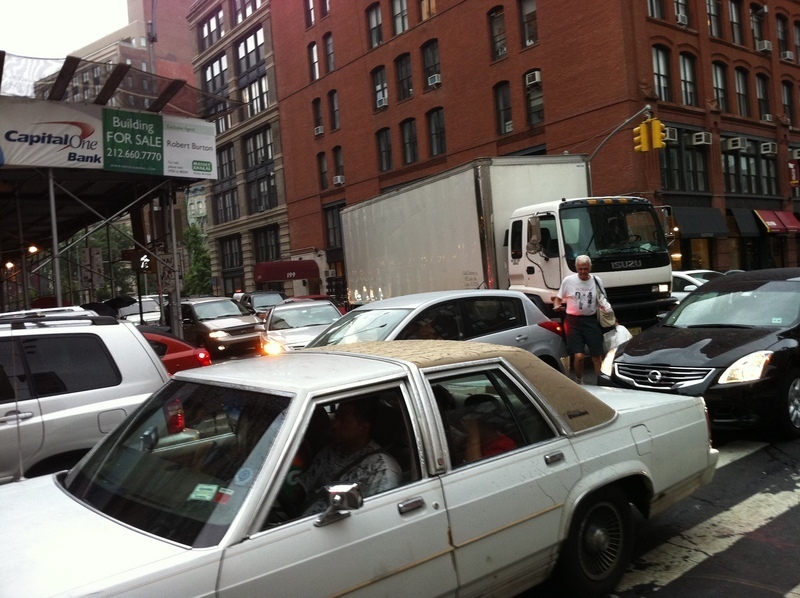 This city has 8 million consumers in tight quarters and they want us more than we need them. Plus, Amazon knows our political class is already hostile to small business. That means that for Amazon, competing here is like shooting fish in a barrel while getting paid by the barrel owner to do it. Oh yes, they’ll be back, and politicians don’t need to take out ads in the Times to talk them into it. The Amazon Prime ‘value proposition’ is just not worth it, individually or collectively. In exchange for the free shipping illusion, Amazon sweet talks you into buying more stuff than you need. One research report found Prime customers spent over $1000 more per year than non-prime customers, and their spending on Amazon increased faster from year to year as they became ever more addicted to the prime machine. Well, get off the machine. Besides, you can get free shipping and same-day delivery in lots of other ways in NYC, both online and off-line. The City held the second public meeting Thursday on its initiative to rezone SoHo/NoHo, focusing on the mixed-use character of our neighborhood. Again some 250 people attended, of whom well over 90% were residents and/or small businesses. Better organized than the first chaotic meeting, the event began with the Department of City Planning offering its statistics on the SoHo/NoHo economy. View the City Planning boards here. You can stream the entire two-hour meeting on Facebook here. However, the audience soon began to disrupt the presentation due to glaring inaccuracies and bias in the report. For example, the City Planning data put much emphasis on retail, office, eating and drinking, and commercial uses. But there was not one iota of data on the thousands of working artists, free-lancers, part-time contractors, self-employed creative people, and other non-payroll workers who live and work in their lofts. More troubling was the Department of City Planning’s lame excuse for SoHo’s empty storefronts: its top two reasons were “zoning restrictions” and “historic district regulation”. This claim, first spread a couple of years ago by the Real Estate Board of New York (REBNY), is clearly contradicted by the meteoric rise in ground-floor rents since the landmarking and the current zoning were introduced in the 1970s. Significantly, the very last reason City Planning listed for empty storefronts was “the spike in retail asking rents”. We who live/work here know that this euphemism for greed is the real reason for the empty stores. Let’s look at the data. According to City Planning’s classic study on SoHo, the Rapkin Report, ground-floor rents in SoHo just before the current zoning and landmarking took effect were $00.80 a square foot – yes, 80¢. Soon after our new zoning and landmarking in the 1970s, rents increased gradually and rationally. And no empty storefronts. 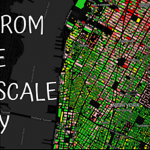 By 2011, Broadway retail rents averaged $328 per square foot, according to a zoning study that the SoHo Alliance conducted with the Columbia Graduate School of Architecture, Planning and Preservation. Then greed and speculation mania took over. A retail bubble developed. By 2015, retail rents on Broadway TRIPLED in four years to $977 per square foot, according to REBNY’s own data. Then the bubble burst. By November 2017, Broadway rents slumped to $678, still more than DOUBLE the 2011 level. By 2018, rentals eroded somewhat further to $595, according to REBNY data. Nevertheless, these rents are still among the ten highest in the United States, according to the Department of City Planning. Yet REBNY and City Planning want our zoning changed as a bailout to greedy investors, which will encourage further wild speculation, higher rents, and more empty storefronts. For City Planning – parroting REBNY’s line – to try to fool us into thinking our zoning “restrictions” and our world-renowned historic district are the two top reasons for the empty storefronts — and not frenzied real-estate speculation and greed — is disingenuous and belies the City’s claim of impartiality. The next public meeting will be held March 21. Residents of SoHo and NoHo were taken by surprise when they learned that their elected officials, Gale Brewer and Margaret Chin, were sponsoring a series of unrequested “participatory community planning” meetings branded (by the Borough President’s office) as “Envision SoHo and NoHo.” It is all about rezoning their neighborhoods. Residents did not ask for this, nor are they in control of the agenda, nor did residents get to hire and fire their own facilitators and experts to work with (assuming they even wanted a forced planning process in the first place). The facilitators appear to be hired by the Borough President’s office, deduced from the logo on the powerpoints. The politicians and Department of City Planning (DCP) maintain control over who gets to play ball on the new zoning plans by means of a classic trick: a tightly managed “advisory group” for the rezoning. Artists have not been allowed on that advisory group and Andrew Berman of GVSHP was basically told not to come when he asked to attend. (Aside: These tightly controlled “fake grassroots” groups seem to be a trend in the city. Brewer used one for Seaport skyscraper fights and the Mayor started several of his own pretend “grassroots” groups to control negative feedback on his plan for new downtown jails.) Thankfully, SoHo residents are not easily fooled: they have set up their own mini-coalition to deal with the situation (with GVSHP). 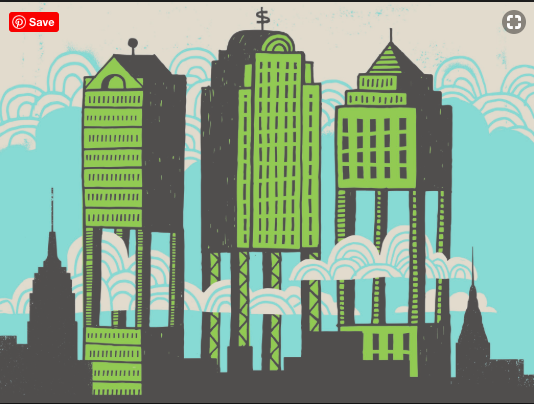 Big Real Estate types have also set up their own mini-coalition, all of which puts in an interesting wrench in the orchestrated advisory group and “pretend participatory process.” Read more here. Neighborhood residents in SoHo and NoHo are quite rightly dismayed at having this dumped on them: during the two meetings held thus far, residents were not allowed to challenge the need for a rezoning, nor were they allowed to ask questions of their own. Instead they were herded by a DCP payrolled facilitator, who, along with DCP staff, carefully framed the problem, designed the program, controlled the questions and responded to or ignored questions raised. It is ultimately very controlling and paternalistic. But alas, residents of SoHo and NoHo interested in the future of their neighborhood have no choice but to sit through interminable meetings they did not ask for. Strangely, when forced at the meeting to come up with lists of complaints about the neighborhood, most residents cited traffic, noise, air pollution, garbage, mega-chain stores, the lack of green space and the absence of an elementary school. Strangely, none of those issues are under the purview of the DCP, so why were they even there? After studying the online video of the second workshop (here), the role of residents in this kind of workshop appears to be only to “participate” like sheep in an extractive process in which residents are situationally compelled to “hand over” information over to the Department of City Planning, who then selectively uses the information thus acquired to justify their rezoning ideas and their particular framing of the problem (in which all problems relate to historic districts and land use regulations, Big Real Estate’s two favorite enemies). DCP retains the initiative entirely. One thing is clear: it is not genuine “participatory” planning worthy of a democracy. At the workshop, DCP people kept asking: how many artists in this room? How many artists rent their spaces? How many artists own their spaces? The reader can guess where this is all going. The press has reported that big real estate has been lobbying behind the scenes for years to get rid of the “Artists in Residence” certification process required for buying property in certain buildings in SoHo and NoHo. To do that, Real Estate needs to argue that the artists are all gone or dying out and that those that are left are somehow irrelevant. Watch for games with the statistics about artists. Big real estate also wants to get rid of restrictions on ground floor spaces in favor of an “anything goes” absence of rules, which in their mind would free up and deregulate more ground floor space to allow for even more giant Uniqlos and Sephoras (as if the existing rules inhibit anything). The code phrase the facilitator uses for this is “giving property owners more freedom” which is a Big Real Estate way of framing everything in NYC. We suspect that big real estate will use the opportunity this process provides for a Hail Mary pass at grabbing a few spot-upzonings here and there. Brewer and Chin are echoing the complaints of Big Real Estate, but are experimenting with this new workshop procedure to mollify residents prior to undergoing the official land use process (ULURP). We also speculate that Brewer will try to insert these painful workshops into the City Charter using the sales pitch that they fix the incredibly flawed and failed ULURP process. Recall that Brewer has agreed with critics that the current land-use process (ULURP) is terrible and needs reform. Alas, these painful workshops do some appear to be the solution. We have other ideas on how to solve the problem (see elsewhere in this newsletter). To make matters even more silly, a real estate investment advisory firm recently sold $50 tickets to a private event called “SoHo and NoHo: After the Rezoning” which presumed that the re-zoning would be a done deal. This author (and many other non-real estate people )bought a ticket, but the next day the event was mysteriously canceled. Keep up with things via the SoHo Alliance here. and read the letter from Sean Sweeney of the Soho Alliance below. Debbie Stoller, representing thegowanusisdirty.com, has attended several of the community engagement meetings and argued that a 14-story maximum building height was initially proposed and now it has risen to 22 stories due to demands from developers. “How many of you guys here are upset about [building heights]?” Stoller asked the audience, with many raising their hands in response. “The height came up in all the Gowanus meetings. I also want to know what happened. Who sold out the neighborhood? Why is what the community decides, developers can override?” she asked over a burst of applause. The image above provoked the following reaction from a local resident calling herself B1217 when it was first posted on Brownstoner here. It has been five months since City Council held a hearing on the SMALL BUSINESS JOBS SURVIVAL ACT (SBJSA), a bill that would level the playing field in the commercial lease renewal process. During the hearing it was made clear by Speaker Johnson and other electeds that “the bill had to be changed”. Well, nothing has been done. CM Ydanis Rodriguez the prime sponsor, said he is open to changes as long as it doesn’t take away rights from our small business owners, most of whom are immigrants. No changes have been proposed and there has been no timeline or update been provided since the October hearing. Like most City Council hearings it is clear now that the SBJSA hearing was nothing but political theater, as our Mom & Pops keep getting pushed out in record numbers. Crown Heights South residents are still working to talk the Landmarks Preservation Commission into landmarking a number of sites in their neighborhood, documented at HDC here. At least one of the buildings faces an immediate demolition threat. This group has been suing the city to force a developer of a supertall to conform to the 80 feet high current zoning rule that the neighborhood had negotiated. We await the outcome of that case. This suit has mulitple litigants and argued two things: the LPC used an illegal procedure to de-ascension a landmark building and also illegally approved a plan to eliminate public access to the famed Clocktower at the corner of Leonard and Broadway. The case was heard in the State Supreme Court on appeal and we await the outcome. We have no information on the status of that case at press time. This is a case about gerrymandering of zoning lot mergers to create a loophole for excessive height. Neighbors have lost the most recent round in court, but have money for an appeal. Sadly, their leader, Claudia De Salvo, died last fall. Claudia was a force to be reckoned with and a real supporter of the Human-Scale project. She is greatly missed. During the last election, residents of NYC got a welcome reform to our City’s Campaign Finance Law: the maximum donation was reduced from $5,000 to $2,000. A few other tweaks were put in place that increased the value of small donations for any given candidate. But these changes just weren’t enough to fix what was wrong. First, the changes ignored the giant loopholes the law created for the real estate industry. (To be clear, there remains in the law a lot of text about “doing business with the city” that allow developers to evade official limits and buy re-zonings.) Second, as anyone can see by scrolling through the spreadsheets of the candidates at the Campaign Finance Board, candidates still have to target the very wealthy for large donations. After all, who can give you $2,000? Answer: the very same people who can give you $5,000. Those who think the lowering of the maximum contribution to $2000 is a great reform should not be feeling so smug. There are two ideas out there to fix the situation. The first is to copy Seattle’s Democracy Voucher system. In Seattle, the city sends every voter four printed vouchers that look like pretend money. Each voucher is worth $25. Candidates then have to go meet the voters to collect those vouchers. Candidates then turn the vouchers over to the city to get campaign cash. It’s a great system: it makes every single voter matter, not just wealthy donors.Democracy Vouchers would also make NYC’s existing loopholes irrelevant. That said, Democracy Vouchers are not perfect (no system is) and face some heavy political lifting to get the change through a timid Charter Review Commission. If that lift is too hard, is there an alternative? The answer is yes: lower the maximum allowed contribution to a much smaller figure based in the median household income of NYC: 1/10th of 10% of the median household income in NYC works out to about $500). At the same time fix the big three real estate loopholes by simply removing the text in the law that allows it). Today, that kind of simple, easy change would put the middle class of NYC in the driver’s seat, a second-best alternative to the Seattle system. Another benefit of this alternative is that there is a purpose to anchoring the maximum donation to the mean income of the area rather than having a number plucked out of thin air. Those 1/10th of 10% figures come from the multi-cultural and ancient practice of calculating a tenth of one’s income for charitable purposes. It is called tithing, which means “one-tenth.” Lowering the limits like this would also have the huge advantage of making the middle class the dominant force in the city’s democracy, which, as even Aristotle noted, is essential to prevent democracies from turning into oligarchies. Of course, you may also need to raise the public-to-private matching ratio from 8:1 to 15:1, but that is also easy. Other tweaks may be useful as well, such as making donations from outside the city ineligible for matching funds. Nonetheless, lowering the maximum contribution to a number linked to the median household income would put the middle class in the driver’s seat and would be an excellent reform in of itself. There has been a lot of discussion within community boards these days about dealing with the so-called “void and mechanical loopholes” in the zoning code. Everyone recognizes that these particular loopholes are a problem. They fail to limit ceiling heights on spaces that “don’t count” against a developer’s allotment of buildable space. Why? They result in excessively tall buildings jacked up on stilts, dystopic streetscapes, and are an end-run around the intent of the zoning code. To the rescue come two different proposals to fix the situation: a weak one from the Department of City Planning (DCP) and a stronger one from Linda Rosenthal, the Assembly Member from the Upper West Side. There is a way to make their two ideas work together, but only if DCP shows some flexibility in the current ULURP process. And hey, DCP really should show some flexibility. After all, they have been only pretending to collect data about these void and mechanical spaces. It appears they do not know the actual measurements of these void and mechanical spaces, but have merely been eyeballing drawings and collecting articles in the real estate press rather than doing the harder work of measurement. That’s no way to do policy. Regardless of how they cooked up their numbers, the City’s proposal to fix the loopholes concentrates on mechanical spaces only (ignoring the equally bad problem of open voids under stilts). DCP proposes to “limit” these mechanical spaces to a 25-foot high floor (or story) for every six stories or 75-feet of living space. That’s it. There are two important criticisms that DCP ought to be listening to. First, the 25-foot figure and the 75-foot figures are both wildly inappropriate giveaways to the real estate industry and are not based on actual data as DCP claims. DCP staff have said in many meetings that “almost all” of the buildings they looked at have about mechanical floors of about 12 feet in height (although it now appears they did not do much actual measuring). But assume their “eyeballing” is accurate. In that case, a more reasonable thing to do is to limit mechanical floors to 12 feet in height (as in the Rosenthal legislative proposal), and insist these mechanical floors be interwoven every 200 feet or more, not every 75 feet. Why should DCP modify its numbers? First, it is obviously the right thing to do based on what they pretend is normal in the industry. Second, it harmonizes the DCP plan with Rosenthal plan, which is more comprehensive and is based in a modification of the State Multiple Dwelling Law. Her idea is to set a ceiling height limit of 12 feet for mechanical floors and a limit for other “no-counts” to 5% of the allocated FAR. 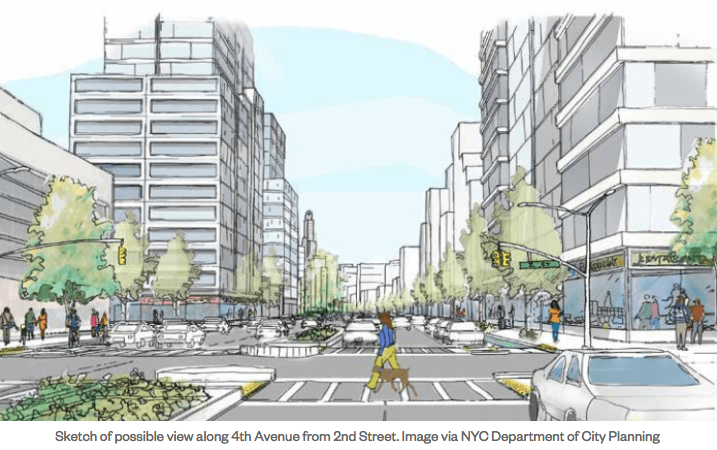 Last, an adjusted DCP plan really must cover the length of 57th Street where so many tall buildings are planned. Sure, Rosenthal’s plan could be improved too if she included voids in the 12-foot height limit while continuing the restriction of “no-counts” to 5% of the FAR total. But she is off to a better start than DCP. Obviously, a much better plan would be to get rid of no-counts altogether, but that is not the offer on the table. While we think Rosenthal’s proposal is superior, it is possible for both proposals to be made to work together if DCP shows some flexibility. Can DCP do that? I am told privately that they cannot. But isn’t that what ULURP is for, to show some flexibility and improve half-baked ideas? No New Jails! How did Criminal Justice Reform Become a Real Estate Scam? Criminal justice reform is about reducing the number of people who get sent to jail, any jail. It is about having laws that are less punitive. It is about bail reform, and reform of the way judges sentence people. It is about reforming the way jails are managed and how people are treated once they are incarcerated. Advocates tell us that if all the important reforms were implemented, only 5,000 would still need a bed at one of the jails on Riker’s Island (which has beds for 10,000 right now). So how did reform of our criminal justice system become about real estate: closing down Riker’s and spending a whopping $11 billion in building NEW jails in over-crowded urban centers? If you smell a real estate scam to offload Riker’s Island to the real estate industry, you are on the right track. Read Lynn Ellsworth’s white paper on the subject here.